A grungy little chiptune synthesiser based on the onboard sound chip of the Sinclair Spectrum • Perfect for chip-based musical styles, or for blipping up your electronic tracks! First there was SpecTalk. 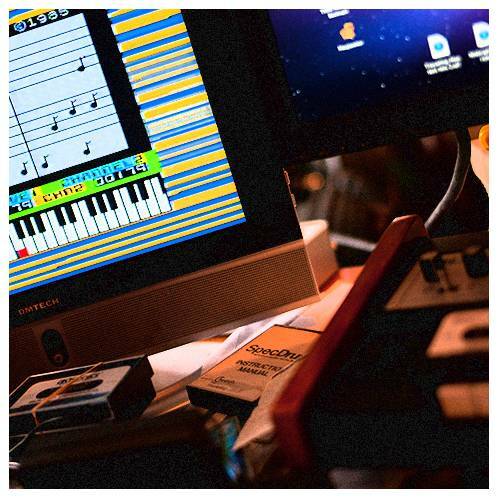 Now SpecTone completes our obsession with Sinclair ZX Spectrum instruments, catapulting you back into the early 80s when making music “in the box” and making chip music were, basically, exactly the same thing. The Spectrum is no Commodore SID (though we have that for you, too – for free! ), but dammit, it can make bleeps and bloops with the best of them, all grainy and shinily aliased. Our SpecTone samples several “music” programs for the Spectrum: the truly, truly cheesy Wham! The Music Box (a primitive sequencer with only one tone, but a handful of Wham!’s greatest hits pre-programmed… what’s not to love? ); some “drum” tones taken from the Wham! program and also from dk’tronics Sound Designer, which allowed very basic waveform editing on the Spectrum’s screen (we used it to create some different tonalities of noise); and, finally, some vowel sounds taken from the Currah MicroSpeech that we used to make SpecTalk. 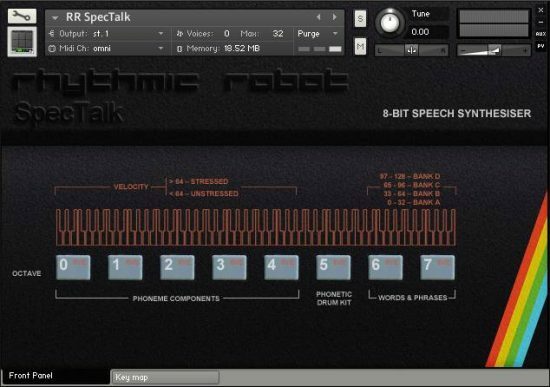 These have been looped and can be blended in with the Spectrum’s basic tones to give a wider variety of sounds: you can choose from Ahh, Arr, Ehh, Err, and Urr vowel noises, with or without vibrato, and either have them on their own or mixed with the Speccie’s onboard chip tone. We’ve also grafted in some effects, including a low-pass filter which you can use to tame some of the vicious aliasing noise the Spectrum likes to generate (though for all we know this might be exactly what you want, which is why we left it in there. The choice is yours!) – plus an ADSR envelope to give you a bit of control over your tones. 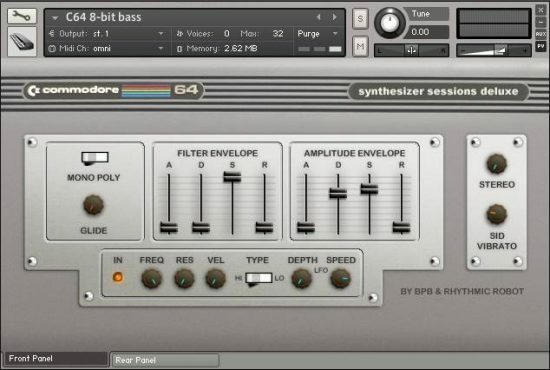 The results are a one-stop-shop for 80s computer tones: basic and grainy in their raw form, but capable of being moulded into pads, leads and effects sounds (though, to be fair, they’re all going to sound a bit basic and grainy… that’s the fun). The vocal waves from the Currah add a new and weird sonic element to the SpecTone‘s tonal palette, and lend themselves particularly well to blended pad sounds and to brief, blippy sound segments. And the drums – or should we say “drums” – are fun, characterful little reminders of what game soundtracks sounded like before Lara Croft and orchestral scoring libraries streaming from multi-terabyte RAID arrays. Let’s just say, don’t leave your 808 at home, okay? But for little moments of 80s colour, they’re great. This synth is fundamental and raw, which is great to have at the ready. Mapping the WAVE CIRCUIT to the mod wheel allows for some performance possibilities, and it’d be great if the VOCAL WAVE SELECTOR had the same live slider possibilities (though that may not be possible, or could be too much of a departure from the original). Sound profile is nearly primordial, as if you are building sound with somewhat slippery binary legos. And that is actually a thing of particular beauty. But ‘particular’ is the key here. I suspect that when the moment comes to need these sounds, very few other instruments will do. And for everytime else, there’s everything else. Great obnoxious ‘80s computer synth sounds, I like it. The err and urr sounds have a somewhat less “in your face” character, so that makes for some nice variety. But there are a few things that bother me with SpecTone. First of all the “err” sound has a pitch envelope instead of volume, I’m pretty sure that’s a mistake. Then there is the “wave circuit” blend knob, where the volume feels all over the place. To the right it gets so loud that, even with comp set to the lowest, the compressor/limiter is absolutely butchering the sound. The blend/crossfade in nanomod 7 is perfect for example, so why is this one such a hassle to work with? And the snare drum… is the sample selection/pitch supposed to respond to velocity like that? Still an awesome instrument for the price though! I’m rather pleased by the synth part (easily tweakable), but the drums part is a disappointment. OMG back to eighties’ gaming. Well done! 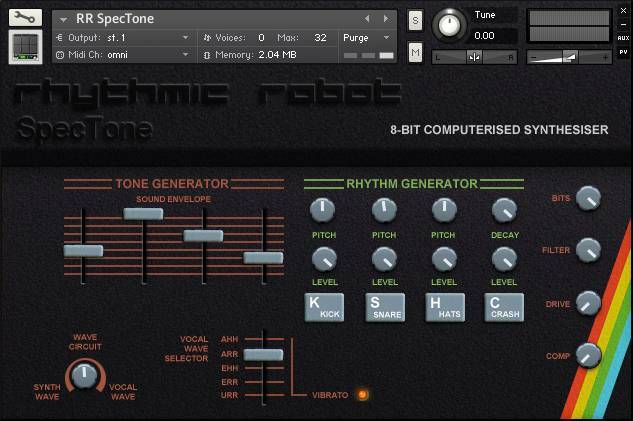 SpecTone is probably the best-value-for-the-money instrument I got, and I didn’t even use the rhythm sounds yet! The Wave Circuit knob and the Vocal Wave Selector makes it quite versatile. One small request for a future release: a Mono switch with Glide time. Thanks again RR! Snotty, Spitty, Bratty. Sits in that “poke you in your nostril” range of the mix, and obnoxiously points out a melody for you, “Hey, Idiot, the melody’s right here!” Of course, it does a couple other things too, but this obvious feature is why I keep going to it. In general, I feel like this is what RhythmicRobot excels at: not the one plug-in that can do anything, but the many plugins that each do one thing SUPER well. Crunchy bits and pieces well worth the Hot Deal price. Wait, I get two MongoMonies back for posting a review, so this ending up being free? Too much input for my signal path – brain freeze! Very cool 80s Spectrum tones for a very low price! Great product, with a great sound! classic! reminds me of the old days! great job! This particular instrument comes in handy when trying to fill the gaps with something interesting and unique. You can create very organic sounds and good quality. Another cool weapon in my musical arsenal! Nice instrument for those hard to make effects. Perfect sounds and perfect price. Lovely wee quirk of a piece. Mess around with the vocal wave selector and out pops usability. Has got a real nice feel to it. It’s off-tune in a good way. 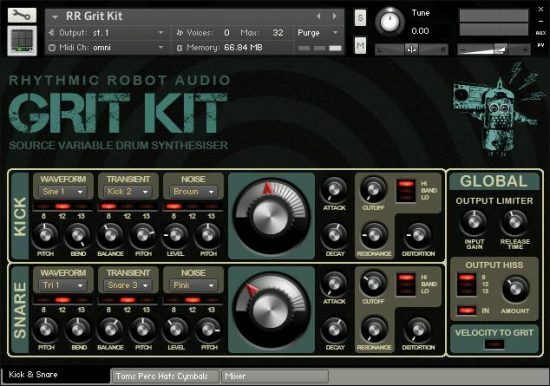 Great Little 8 bit Synth with extra Drum beats – if you want a versatile little 8 bit creator this is great the formant section really changes the sound of the instrument and the knobs on the right hand side add grit and presence. Rhythm samples are a bit limited though – I don’t actually use them, Mongo couldn’t be expected to sample 88 drum hits just for this little cupboard unit and at this amazingly low price – this only minor issue I have and on balance amazing chip tune style synth for the price!!! All our Kontakt instruments require a full version of Native Instruments Kontakt version 4.2.3 or later (all versions of Kontakt 5 are supported). Our stuff will load in Kontakt Player, but only in “demo mode” which times out after 15 minutes. For this reason we strongly recommend that you only buy from us if you have a full version of Kontakt. See the FAQ page for more information.